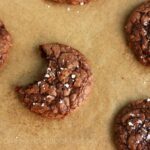 These Salted brownie cookies are my go-to when I’m in need of a chocolate fix! Crunchy outside with a soft and chewy center gives you the perfect brownie texture in every single bite! Brownies are definitely on the top of my favorite desserts list. I am not a huge chocolate fan but something about a fresh warm pan of brownies pulls me into a sugar coma. When it came time to pick my new years dessert those sweet bars were at the top of my list! 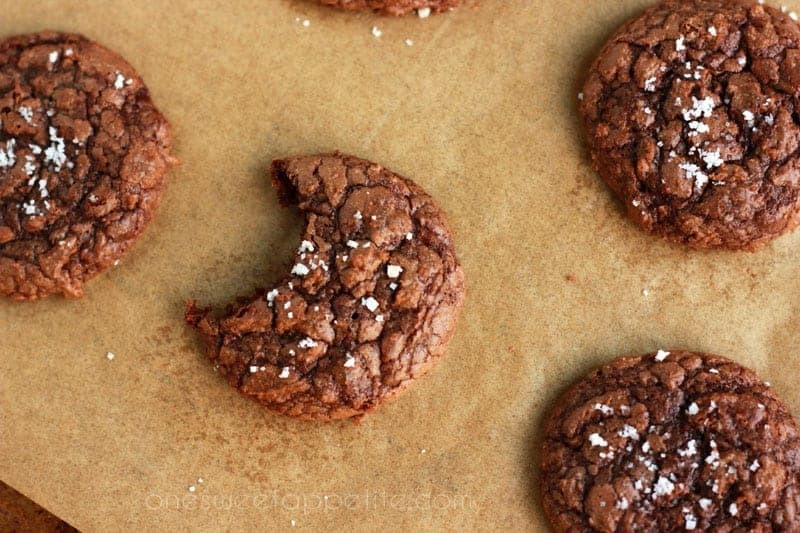 That is a brownie in cookie form… or would it be known as a cookie as a brownie? Either way these are delicious. Top them with a sprinkle of fleur de sel (fancy salt) and you’ve taken them to gourmet status! 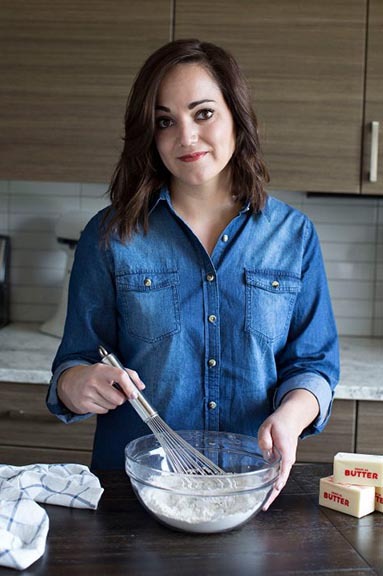 I originally stumbled onto this little gem of a recipe over at Jen’s Favorite Cookie. It was late one night and I had a craving. With no box mix in sight, and only a bag of semi sweet chocolate chips in the pantry, it looked like I had no other choice. I am SO glad I gave it a go and tested this recipe on my picky husband. 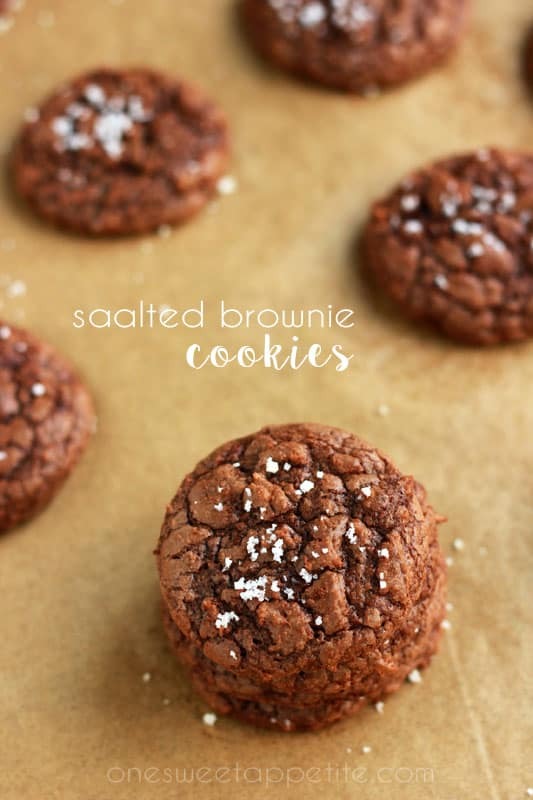 We are BIG fans of the salty sweet combination and after just a few modifications these cookies nailed the flavors we were looking for. I made a half batch that night and by the time the last one disappeared into my belly I was wishing I would have made a full. After a few adjustments to the original version I decided it was finally time to share the recipe with the world! Or… you. My readers. Like this recipe? You will love my BEST Brownies, BEST Chocolate Cake, and Chocolate Cake Donuts! Preheat the oven to 350 degrees. Line two cookie sheets with parchment and set aside for later use. Combine the butter and chocolate chips in a microwave safe bowl. Heat in 30 second intervals, stirring in between, until melted. Set aside. Add your eggs, sugar, and vanilla into the bowl of an electric mixer. Beat with the paddle attachment 3-4 minutes or until fully combined. Slowly stir in the melted chocolate mixture. In a small bowl combine the cocoa, salt, baking powder, and flour. Fold into your batter. Drop spoonfuls onto your prepared sheets. 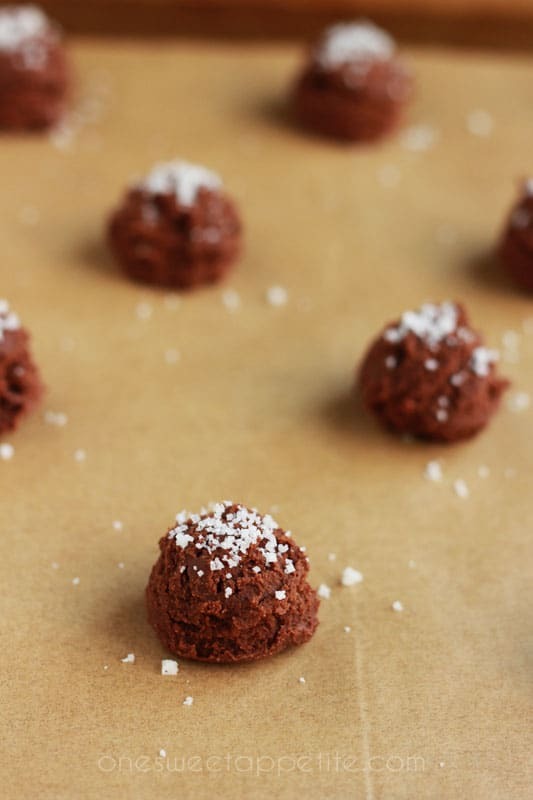 Sprinkle each cookie dough ball with fleur de sel. I got 3 dozen small cookies.